AFTER ITS award-winning run on this year’s festival circuit, Compántas Lir are back in town with their emotive interpretation of the play The Glass Menagerie by Tennessee Williams before it opens the RTÉ All Ireland Drama Festival in Athlone on May 3. No strangers to competing on the circuit, Compántas Lir won the confined section two years ago with their production of ‘Proof’ by David Auburn and are now back once more in contention as finalists, for the first time, in the prestigious Open section. Having a long tradition of competing on stage and performing for local and national audiences, spanning back almost 40 years, this Claregalway/Carnmore-based drama group are delighted to announce two upcoming dates in Galway where local audiences can catch their show before the All Ireland Festival. The Glass Menagerie will be showing in An Taibhdhearc in Galway city on Monday April 30 and Tuesday May 1. This highly moving and visually stunning production, directed by Dermot Hession, features Vincent Moran as the main protagonist Tom, Liz Hession in the role of nostalgic southern belle Amanda, Deana Mc Guire as the delicate Laura and Darragh Moran in the role of the highly-anticipated gentleman caller, Jim O’Connor. 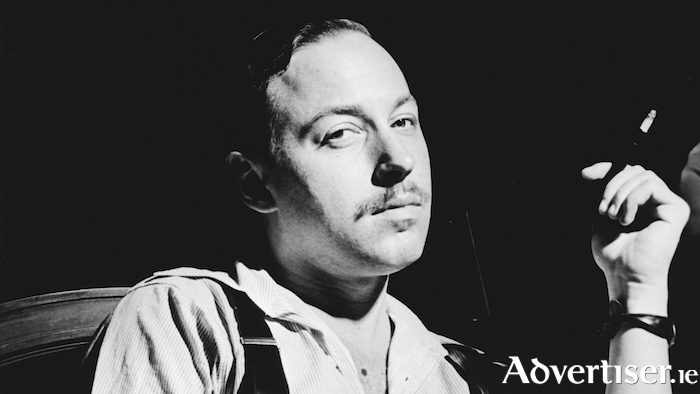 First performed in 1944, The Glass Menagerie was Tennessee Williams’ breakthrough play. The story, as told through the memories of Tom Wingfield, elude to Williams’ own past. In this production Compántas Lir have put more distance between Tom and the ghosts of his past. In what is a fresh revision of the piece, which Williams himself described as the saddest play he ever wrote, Compántas Lir offer audiences an opportunity to view a play that was a breakthrough piece of theatre in its own time. To this day, The Glass Menagerie evokes a haunting reflection of Williams’ personal struggles, and that of all lost poets. Set in St Louis in the later 1930s, The Glass Menagerie is, at its core, a play centred on memory which recounts the life of Tom Wingfield. Through Tom’s narration, interspersed with nostalgic scenes from his past, we are brought on a journey of retrospective discovery. From observing the complex relationship he remembers experiencing with his overbearing mother, to the timid moments of affection he shares with his fragile sister Laura, to memories of youthful bravado he shares with his friend Jim O’Connor, we are given a glimpse into the life of a man who dreams of escaping his reality and aspiring to a greater life. From moments of exhilaration to those of heartbreak, this play takes the audience on an emotional journey with Tom, and is a production not to be missed. Tickets for the An Taibhdhearc shows are available priced at €13.00. To book online please visit www.antaibhdhearc.com or ring 091 - 562024.